Brad Spokes clears the ball. Picture Justin McIntyre. 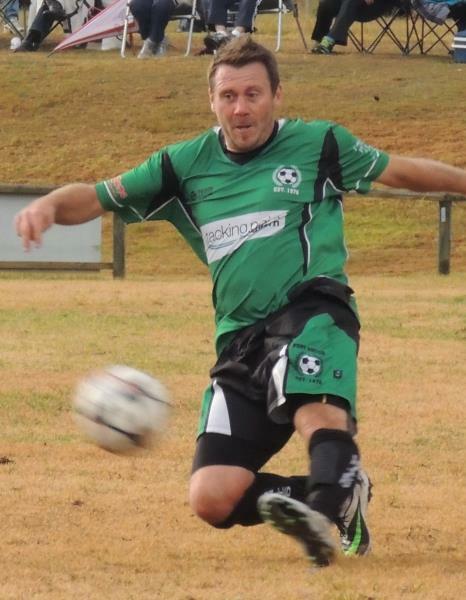 PORT United continued their run of good form on Saturday when they took on the fourth-placed Taree Wildcats at Omaru Park in Taree in the Mid North Coast Soccer Premier League. A resounding 6-1 victory for the Port outfit consolidated their top two position and keeps them right on the heels of competition front runners Wallis Lake, who are four points ahead. The Wildcats went into the match with the third best defensive record in the competition behind the top two sides and they’d also only tasted defeat once on their home ground in season 2014 to Wallis Lake (1-3). The heavy defeat at the hands of United however, sees them drop to 6th after other results went against them in a congested middle of the table. United started the match well, and they were rewarded with the opening goal in the 16th minute when Lucas Heagney struck a bullet free kick from 30 yards out that gave the Taree keeper no chance. Leading scorer Daniel McGovern then scored twice before half- time in the 37th and 44th minutes to give the visitors a commanding lead at the break. The first of McGovern’s goals was on the back of quality build up play from Simon Granfield and Liam Clarke before he found a composed finish for his second following a defence splitting pass from skipper Andy Collins. Taree came out for the second half with plenty of energy in a bid to get back into the match and revived their home crowd when they pulled a goal back. It came via the penalty spot after a United player committed a foul in the goal area just five minutes into the half. Despite the break through, chances were at a premium for the Wildcats as they looked to build some pressure on their opponents. With a little over 20 minutes left in the match, United unleashed a flurry of goals, scoring three in the space of seven minutes. The fourth of the match was set up by Josh Casey who produced a superb pass to find the run of Granfield who finished well. Some great team play then led to the fifth when Clarke was released down the left flank before he fired an unstoppable shot inside the far corner of the goal. The sixth and final goal of the match was scored by McGovern to seal his hat-trick. His strike under pressure was perfectly placed across the Wildcats keeper and inside the far post. The goal was McGovern’s 17th of the season in 14 matches which sees him a major contender for the golden boot award in First Grade. United coach Chris Walsh was a happy man after the game. “Our decision making was great today and everyone played their roles well. If we can play with that intensity and belief each week, we’ll be in good shape come finals time,” coach Chris Walsh said. The clubs Reserve Grade side also consolidated their top two spot with a 2-1 win over the Wildcats. First half goals to Jake Avery and Adam Breust proved to be the difference despite a lacklustre second half allowing the home side back into the match. It is another three points in the bag for the side though and keeps them within striking distance of top-placed Wallis Lake, should they drop any points in coming weeks.